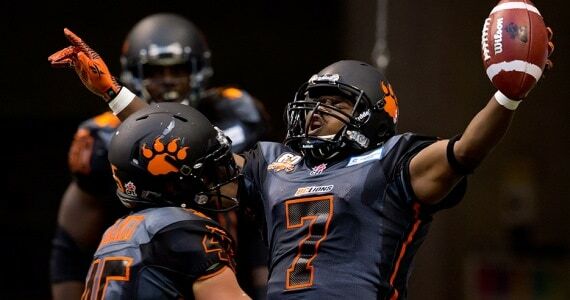 The BC Lions needed to make a statement against a big West Division rival and Saturday night at BC Place their defence did just that keeping Jon Cornish in check and in the process delivered their biggest win of the season to date. Here’s how I saw it, From the Stands. I’ll be honest; when the Lions first came out I wasn’t sure about the new uniforms. The helmets with the matte black gun metal look were outstanding, but the numbers on the jerseys were hard to make out. But as the game went on they started to grow on me. After the game, seeing them on TV and in photos, they look very slick. They have a very mean look to them, and judging by comments on social media and the fact they sold out of them at the stadium last night, fans approve. If the Lions are going to wear this edition more often, the helmets are going to need to be touched up a lot by Kato and crew. At the end of the game Adam Bighill’s helmet looked like it was in bad need of some bodywork. I see a purchase in my near future. Heading into the game the Lions defence was going to have to play a huge role if the Lions wanted a chance to win against the Stampeders. They did just that, getting good pressure on Kevin Glenn all game, forcing him to hurry his throws on several occasions. They were only credited with one sack on the night but could have had others had Glenn not thrown the ball at the turf at the last second. I thought Khreem Smith had another strong outing for the Lions, and to me he’s been the most consistent player on the Lions defensive line this season. The secondary did a great job in coverage as well, with the Lions throwing a new wrinkle at the Stampeders by playing more man coverage versus zone. It worked as they held Glenn to under 200 yards passing and didn’t allow the big play to hurt them all night. The Lions finally had a good night on special teams as Tim Brown electrified the crowd with a huge kickoff return immediately following a Stampeder touchdown. Coverage on teams has been decent all season and that continued Saturday as the Lions kept the always dangerous Larry Taylor in check. I thought Jason Arakgi had an outstanding game on cover teams. The Lions did enough to win this game on offence, but they can probably thank the defence for that. The opening drive of the game was impressive, the club’s best start to a game this season. Andrew Harris was held to just 56 hard running yards on the ground but added 61 through the air. However, after the first drive the Lions offence sputtered at times and it was a combination of receivers not getting open, some suspect play calls and poor decisions by Travis Lulay who was average on the night, throwing three interceptions. The most puzzling decision was the need to go deep late in the game with the Lions up by two. Lulay underthrew his receiver resulting in a pick deep in the Stamps zone. The Lions defence stepped up and got a safety to give the Lions a four-point cushion. Even so, with that much time left on the clock, the offence would have been better off methodically working themselves downfield, taking time off the clock and at least getting a field goal at that point in the game. On the post-game show questions were once again being raised about Lulay’s arm strength and the chance that his shoulder issue from last season could still be lingering. Only Lulay knows the answer to that question, but he has been underthrowing receivers often this year. Just fewer than 30,000 fans enjoyed Saturday’s contest and it was the loudest I’ve heard BC Place in a long time. It seems the effort the club has been making to educate fans is starting to have an effect. There was one offensive wave (that turned into a defensive one following a video review process), but the fans had an impact late in the game and Kevin Glenn commented on it in his post-game media scrum. Here’s hoping as we go forward into the meat part of the schedule the crowds and the noise keep building. Say what you want about the rivalry between the two clubs on the field but when Nik Lewis went down with that ugly leg break, Lions players immediately dropped to a knee and went into prayer. Lewis himself thanked BC players and fans on Twitter following the game for all the support and well wishes. We wish him a speedy recovery, because the league needs players of his calibre on the field. What were your thoughts on the game? I would love to see your comments here. Enjoy your week everyone, and make sure to follow along on Twitter @BCLionsDen, and visit us on the website for our latest podcasts and blogs.